Last year the Automotive sector delivered the Overall winner with MAN Truck & Bus. Could the sector do it again this year? The judges felt that Belron’s cost to serve project was still at too early a stage for this year, but they would be keen to see the results next year. That left the two front-runners in this category as Jaguar Land Rover Global Test and Euro Car Parts. 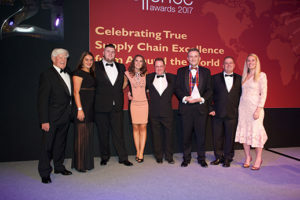 From left to right: John Harvey, Chairman of Keswick Enterprises, Lou Hiden, Head of Internal Communications, Euro Car Parts, Tom Healey, Warehouse Shift Manager, Euro Car Parts, Lucy Orchiston, HR Business Partner, Logistics, Euro Car Parts, Steve Barraclough, Head of Programme, Logistics, Euro Car Parts, Ben Baldwin, Director of Logistics, Euro Car Parts Brian Gallagher, Head of Logistics Continuous Improvement, Euro Car Parts and host Sara Pascoe. conditions. Previously, the process was conducted in a rather ad-hoc fashion, which resulted in wasted time and money. The company’s new initiative has streamlined the process, reducing the time and cost involved in progressing vehicles through the development cycle. The judges were impressed by the challenges that the team faced, which included migrant and security concerns at freight hubs, the reduction in the number of prototype vehicles available and the ramping up of the unique vehicle programmes they needed to support. The judges could see the benefits that came from the reduction in development time for new models and applauded them for their results, but they fell slightly short of the winning entry. Euro Car Parts distributes parts for all makes of cars and light commercial vehicles and has more than 130,000 different stocked part numbers. The company had outgrown its 400,000 sq ft warehouse facility and was finding it necessary to operate out of multiple sites to simply manage volumes. To cope with the growth of the business the decision was taken to invest in a new highly automated distribution centre, enabling the consolidation of parts into a single 1.1 million sq ft facility. The new £75 million development combined ASRS technology, a fast tote pick area with capacity to pick 800+ units per hour, a FlashPick operation of 500+ units per hour, a 15 crane mini-load system and articulated robots for tote stacking of dollies for despatch. The judges felt that this was a well-executed project that has produced transformative results for the business, enabling the company to grow and compete in a market where processing orders and speed of delivery is absolutely critical. The judges’ decision was unanimous – the trophy for the Automotive Industry Sector went to Euro Car Parts.